Feature Recognition: What is History free editing? How to check whether a 3-D modeler is history free? What is History free editing? How to check whether a 3-D modeler is history free? Let me explain history free editing with a simple example. Make a model as shown in Fig A as per the sequence given below. 1. Make a cube (100x100x100). 2. Make a central hole (50 Dia. x 75height) from the bottom of the cube. 3. Make another cube (75x75x75) on top of the first cube. Now, try to modify the height of the cylinder from 75 to 150. 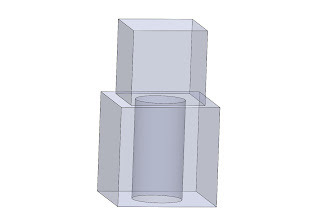 In a history dependent modeler, the height of the cylinder after modification will only be 100 instead of 150 as shown in Fig B. Whereas, in a history free modeler, the height of the cylinder after modification will exactly be 150 as shown in Fig C.
The faulty modification caused in history dependent modelers is due to the fact that model re-evaluation is based on the chronological feature creation order i.e. a new boundary model is created by sequentially re-executing the operations in the modified history. 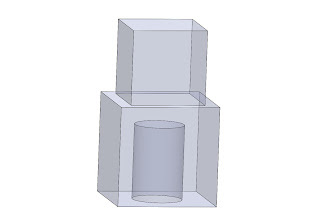 Hence, even though the modified height of the cylindrical hole is 150, on subtracting the cylindrical hole with a cube of height 100, the hole becomes a through hole in the first cube. Then the second cube is placed on top of the first cube. 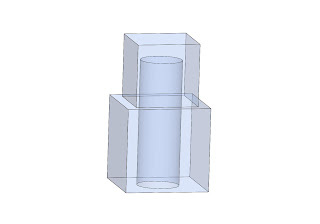 Whereas in history free modelers, the modification is handled in a different manner that only the immediate faces connected to the modified face/dimension are modified. Even though, such modelers are powerful in history free modification, model modification requirements such as converting a through hole/pocket into a blind hole/pocket or vice versa is better accomplished using feature information.